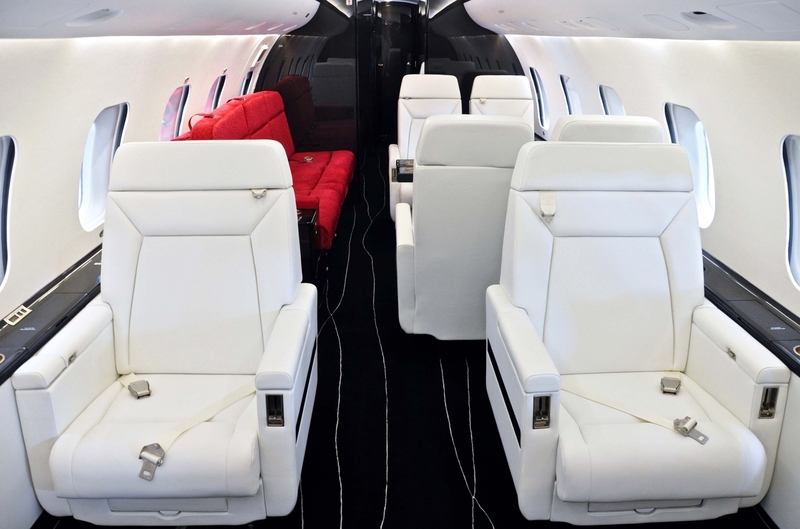 Flying Colours has delivered an enhanced carbon-copy of the innovative red, white and black carbon fiber cabin, that was originally designed for a Bombardier Challenger 850 in 2013. The same customer’s pre-owned Bombardier Global Express, left the Canadian company’s Peterborough facility this week, having received an equivalent makeover. The floorplan was modified to accommodate a new configuration in the mid-section per customer request. Two seats opposite the central divan were replaced with a four-seat conference group incorporating new Rockwell Collins Global seats. The shape of the existing cabin seats’ head and arm rest were changed, and the seat-swab made larger, to match the newly installed mid-cabin layout. All the seats were upholstered in pure white leather with a carbon fiber armrest accent. The cherry-red divan, which provides a splash of colour in the mid-cabin, is complemented by a second black three-seat divan in the aft section. The original fabrics for the seating and soft furnishing were replaced with new, improved materials to support the increased usage the Global range allows. Behind the scenes, the installation of Honeywell’s Ka band JetWave™ system required the addition of an aft LRU radome and antenna, to radically update the connectivity. Faster, richer data transfer, enables live streaming, and WiFi access across multiple personal devices throughout the cabin. Monuments comprise predominantly black and grey carbon fiber veneer, finished with an ebony wood edging. The colour scheme continues through the upgraded galley and washroom which feature bright white countertops. Tai Ping’s handmade carpet, showcases a white branch design providing definition to the black background. Throughout the cabin satin nickel finishing on all the metal work complements the elegant style. On completion, the exterior displayed a new customised paint scheme featuring a distinctive charcoal grey and gold scheme. Flying Colours also conducted the pre-buy inspection and customer-requested maintenance inspections, which ran in parallel with the interior modifications. Completed at the Peterborough facility, the project took approximately six months to realise. “The customer was clearly delighted with our initial design, which was one of the industry’s first to feature so much carbon fiber, and is extremely pleased with the new-look Global. Refurbing the cabin has given him an as-new aircraft, completely personalised to his taste, within a short timeline and budget. It shows how much you can achieve with great design and engineering. We don’t often get to repeat, and improve a design. We are already looking forward to the next version,” adds Gillespie.